Gothic Instruments just added a fifth volume to their renowned DRONAR series of cinematic sound design tools called DRONAR: Cinematic Atmospheres. In this edition, the developers wanted to provide modern media composers with a flexible tool to create evocative, mysterious and abstract sounding soundscapes and atmospheric beds. Making extensive use of freshly recorded and processed environmental source sounds from water, thunder and electricity, Gothic Instruments set out create a comprehensive toolbox of moody and suspenseful cinematic drones, perfectly suited for the SciFi and Horror genre. For Dronar: Cinematic Atmospheres, Gothic Instruments teamed up again with composer and sound designer Alessandro Camnasio whose sounds can be heard in countless blockbuster trailer music campaigns for movies like Transformers 4 – Age Of Distinction, Captain America: The First Avenger or THOR. On occasion of this review, I had the great pleasure to chat with Alessandro about his part of the creation and production of Dronar: Cinematic Atmospheres. You’ll find the interview at the end of this review. After using the sound of live strings, guitars and analogue synthesizers as source material for atmospheric drones and pads, this time, Gothic Instruments focused on the weird sonic beauty of natural and technical environmental recordings. Those include the sound of natural forces like water, wind and thunder, as well as abstract and obscure technical noises deriving from magnetic fields, electric sparks or industrial machines. Those sounds were then heavily processed and turned into long, effectual loops that can be played, combined and further manipulated by the user. The DRONAR engine which houses Cinematic Atmospheres is built upon a very clever concept. 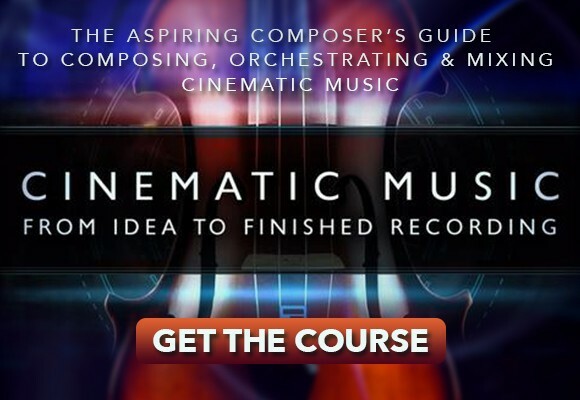 It allows beginners and composers in a time crunch to instantly achieve convincing results while at the same time encourages advanced users to really dive into the engine and come up with completely unique and new textures. The library’s sound engine is composed of four layers called Low, Mid, High and FX. Each layer covers its own spot in the frequency spectrum. You can load up a set of two source sounds for each layer, which allows you to create combinations of up to 12 unique sounds or loops. Whenever you hit a key or chord on the keyboard, the Dronar engine figures it out, spaces the notes and spreads them across the different ranges. Now, in the previous editions of Dronar, the main focus of sonic expression lay on the three ‘tonal’ ranges of the engine, while the FX layer represented kind of a bonus, ‘fairy dust’ layer. 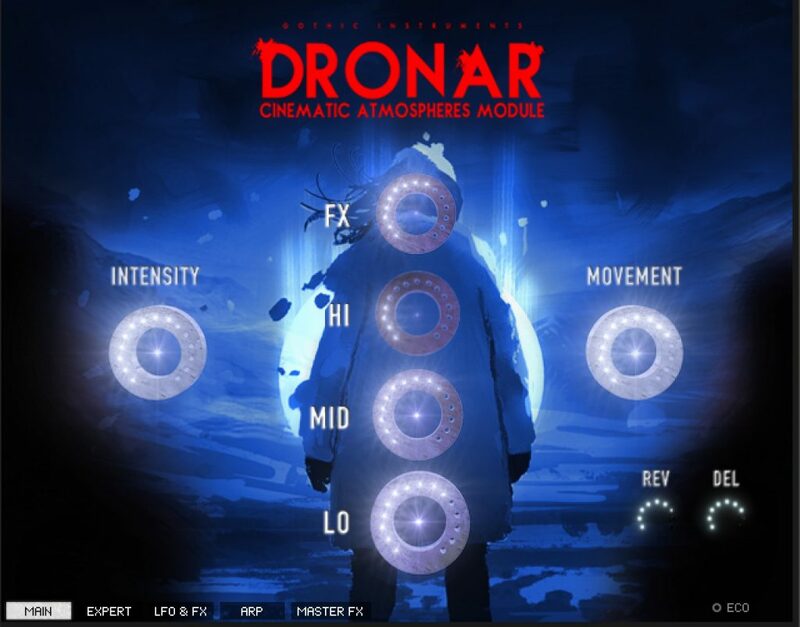 In Dronar Cinematic Atmospheres however, the developers concentrated heavily on the role of the FX dial and made it the centerpiece of the instrument. This seems pretty reasonable as most of the environmental sounds captured were non-tonal anyway. This doesn’t mean that you can’t play actual pads or chords with this instrument, though! Most of the patches have defined tonal centers, it’s just that there’s more of a focus on the unsettling textures, undulating pulses and eerie atmospheres you can add in with the FX layer. This recent edition of Dronar features all the functions and controls you might already know from previous editions using the engine. Since I already went deeply into all the control pages of the Dronar engine in my reviews for Dronar Live Strings and Dronar Dark Synthesis before, I will only give you a quick little refresher in the following. However, please feel free to stop by at any of the aforementioned reviews if you want to learn more in detail about Dronar’s diverse control and modulation options. When loading up any of the preset patches supplied with the instrument, the first thing you will see is Dronar’s main page. Here you will find about anything you need to perform interesting atmosphere sounds that evolve over time. With the four layer dials in the middle, you can control the volume of any layer blended into the mix. The adjacent ‘Intensity’ and ‘Movement’ dials help you get some excitement into steady pads. The Intensity dial, which is also controllable with your modwheel, works like an expression control in that it lets fade through a sound’s different velocity layers – from silent to full force. The Movement dial is connected to the intensity of the engine’s arpeggiators. If one or more of the patch’s sounds are assigned to be modulated by an arpeggiator, the Movement dial controls how much of an effect the arp has on the original sound. The next four pages (accessible via tabs to the lower left) contain all sorts of advanced controls, the just mentioned arpeggiator and LFO, a set of global FX as well as the Expert tab. The Expert tab is where you will find all the source sounds that are loaded into the four layer engines. Here you can switch and combine source sounds, adjust their blend and assign them to any of the modulators. Probably one of the most interesting features of the Expert page though, is the nifty little ‘Randomize Samples’ button at the top of the page. Pressing this button will keep all of your settings but instantly swaps all the samples in the 8 named sound slots with new ones. This is a perfect method if you’re on the look for fresh sound variations. Once you’re happy with the combination, make sure to save your patch though, in order to keep it permanently. Let us take a look into what’s inside the library. Cinematic Atmospheres fortunately follows the same folder and preset structure as its predecessors, which makes finding and loading appropriate content pretty easy. There are two ways of loading and using patches in Dronar, each one with its own particular use. The easiest and probably also the most convenient one if you’re checking out the library for the first time, is to go for the ‘Menus’ folder. This folder contains 11 patches, each one grouping a set of single presets into a bank or menu. If you load up the first menu called ‘Arrakis’ for example, you effectively get a set of 12 switchable single presets combined into one big patch. This allows you to quickly audition between the presets and find out which ones you like the most. You can easily switch presets by hitting one of the according key switches from F0 to E1. Another option to access sounds is to directly load up one of the single presets found in any of the remaining 11 preset folders. As you may have noticed, these are named after the aforementioned menus and also contain the exact same set presets. Only difference is that the sounds are broken up into individual patches. If you load up a single preset, the same sound patch is loaded into any of the 12 key switch slots. What’s great about this is that this method allows you to build your very own preset menu. If you want to, you can create up to 12 variations of a single preset and then switch between them. Now, how does Dronar Cinematic Atmospheres sound? With all the meticulously pre-build patches and presets, you get loads of different, interesting atmospheric colors. It’s apparent though that most of the sounds are residing in the emotionally darker realms of film and TV world. You can find plenty of deep and mysterious ambiences, undulating, intense pulses and otherworldly pads, always interwoven with unnerving and tense effect textures. And those effects layers are what makes this sample library so special, as they allow you to really go into sound design and convey emotion with impalpable but at the same time strangely familiar ambient textures. 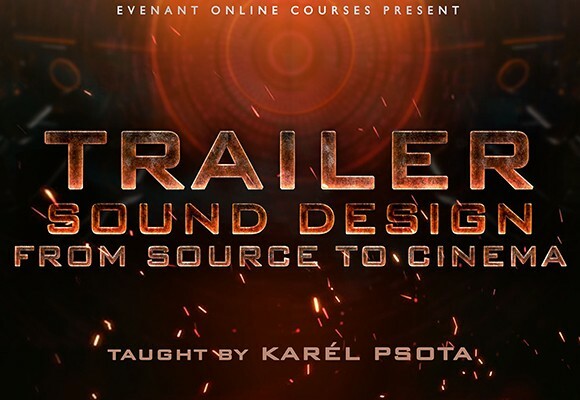 The source sounds are flawlessly captured and expertly processed by sound designer Alessandro Camnasio, which makes them a versatile sonic treasure trove for your own experiments. 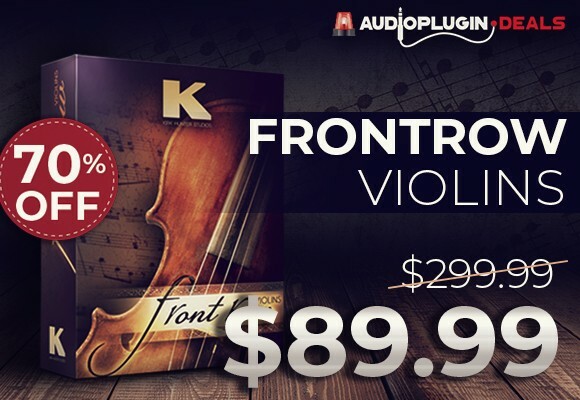 Even if you just want to use the presets created by various working film and TV composers, you will have plenty to take from. Before we move forward to our conclusion, I’d like to slide in my little interview with sound designer Alessandro Camnasio, who recorded and processed all of the sounds in Dronar: Cinematic Atmospheres. I had the pleasure to chat with him about his work on the product. EPICOMPOSER: Alessandro, would you please introduce yourself to our readers really quickly? What is your musical background, how did you get started as a composer & sound designer and how did the collaboration between you and Gothic Instruments came to life? 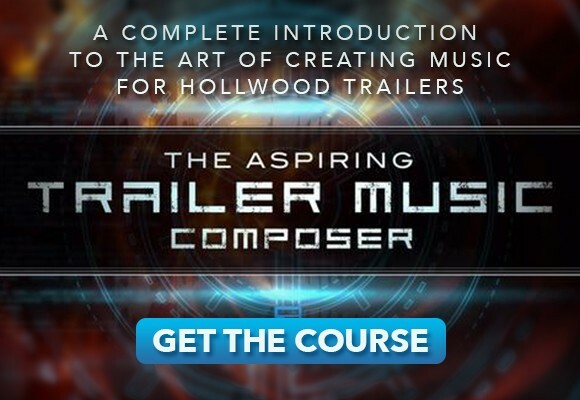 AC: I am a composer and sound designer who mainly works for Hollywood movie, TV and video game campaigns and also creates sounds for virtual instruments. I also work as a recording engineer for classical music and run a label. Since my childhood, I have always been fascinated by music and technology. I started taking piano lessons at the age of ten. Then I was introduced to synthesizers and soon had the desire to create my own music and sounds. As time went by, all those passions came together, brought me the very first chances of getting work and led me to study at the Conservatory of Milan, from which I own three degrees in Composition, Electronic Music and Sound Technology applied to music creation with a thesis on Sound Design. During the last years, I worked with Dan (Graham, CEO @ Gothic Instruments) on many projects related to the Hollywood media industry. So, when he had the idea to start that company, he asked me if I was interested in a collaboration and the Scupltor and Dronar series came to life. EPICOMPOSER: How did you come up with the idea to create a new Dronar edition, focusing on the sound of natural and technical environmental recordings? AC: At the beginning, we just wanted to release a Dronar edition based on different types of noise, but when I started to work on the core content, I realized that I could take some of the sounds to a more abstract, fascinating plane by using exoteric processing techniques. EPICOMPOSER: How do you choose which sound sources you want to record? Is it a trial and error process or do you always have a plan before pressing the red button? AC: Usually, I have a clear idea on finding a raw source that would be useful to design a sound with and prepare my set-up accordingly. However, during the session I often take the chance to experiment with the material (instruments, objects, etc.) and try to see if I can get other interesting sounds, also by approaching it in an unconventional way. Some recording and sound design sessions happen just out of curiosity; I then leave the results on my hard drives for a while, until I find a place for them in a project. EPICOMPOSER: Was there any type of source you thought would yield an amazing sound, but ended up with an underwhelming or completely different result instead? AC: I think it’s important to keep our mind (and ears) open and free from preconceptions. That’s why I start most of my recording sessions for sound design with modest expectations, just thinking “ok, let’s try this” or “this thing makes an interesting sound”. I don’t really think “I’m going to create an amazing sound now”. The more experimental the recording session, the more raw sounds I try to record to raise the chances that I’ll have some interesting material for later sound design stages. Also I believe in happy accidents, especially when you are trying to get a specific result and you stumble on something else. EPICOMPOSER: After recording the raw sound of magnetic fields, water or electric machines, how would an exemplary processing chain look like for Dark Atmospheres? Are there any particular processors or plugins you find yourself using regularly? AC: The most important thing for me is to have a good recording of the material I can use for further sound design. That’s why I find myself using high-definition microphones, like the Sanken CO-100k and the Earthworks QTCs, more and more. Since I use processing chains to sculpt the sound and I very much like to experiment, I always change them. Usually, I create a sort of basic processing chain for the project (or for a specific part of it) with many plugins and then try different combinations to see what they bring. The only thing that is always there in my processing chain is a limiter, but I like to change it on a case by case basis, since each limiter shapes the sound in a unique way. EPICOMPOSER: In which musical and/or cinematic area would you see Dronar Cinematic Ambiences to be the most useful? AC: I think Dronar Cinematic Atmospheres will find its way in all the projects that need evocative and mysterious sounds: horror, thriller and sci-fi soundtracks, ambient and electronic music, and every musical production that tends to crossover different genres. EPICOMPOSER: Are there any tips you could hand on to an aspiring sound designer? AC: Learn anything you can about music, sound technology and related topics. Be curious, experiment and have fun to the point that you are fully involved in what you are creating. That’s the only way to do a great job. Until October 10th, Dronar Cinematic Atmospheres is available through Time+Space for an introductory price of $63.36 (regular price $79.20). If you already own another edition of Gothic Instruments’ DRONAR or SCULPTOR series, you can make use of their loyalty discount and save another 20% on a new purchase.